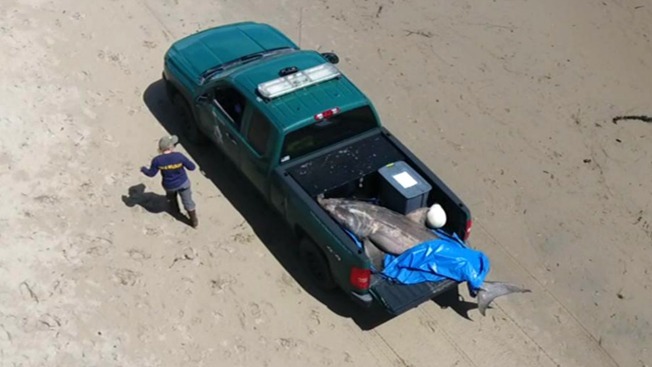 The body of a stranded white shark, who washed ashore in Santa Cruz Friday afternoon, was pulled from the water near the Capitola Wharf on Saturday. The 10-foot, adult male shark likely succumbed to a rare bacteria — carnobacteroum infection — before teams from the Marine Mammal Center and the California Department of Fish and Wildlife eventually plucked the carcass from the water after several failed attempts, according to marine biologist Giancarlo Thomae. Beachgoers in Santa Cruz got quite a shock Friday when a white shark washed ashore. Ian Cull reports. 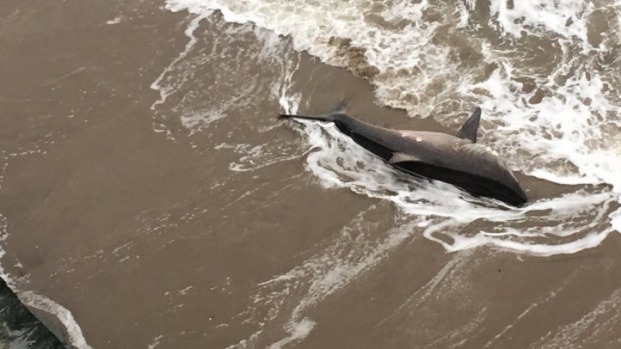 Beachgoers in Santa Cruz got quite a shock Friday when they spotted the struggling marine animal at Pleasure Point Beach around 4 p.m.
Awestruck bystanders said something seemed to be wrong with the shark. Some waded into the water in an attempt to push the predator back out to sea, but they weren't able to do so. Researchers with the Pelagic Shark Research Foundation also made an unsuccessful attempt to rescue the shark. They said it appeared that the young adult male shark was likely sick, because it was unable to steer itself. "We were able to get the shark uprighted and in the water, but it just turned around," said Sean Van Sommeran with the Foundation. "It was aimless." Although high surf pushed the shark out to sea twice, storm-like conditions kept pushing it back to shore. Video from the scene showed a shark with seemingly bloodied fins being tossed around like a rag doll by the strong current. Researchers say it's the first beached white shark seen in the Monterey Bay in three years, and the first adult male shark seen in decades. “I’ve been here 50 years, and that's the first time I've seen something like that,” said Gary Buthman, who captured footage of the scene. Volunteers from the Marine Mammal Center as well as wardens, rangers, firefighters and California Highway Patrol officers responded to the scene, according to the Pelagic Shark Foundation. Once darkness set on Friday, the shark was no longer visible, and researchers had no idea where it was until it popped up in the water south of Santa Cruz near Capitola on Saturday. The exact cause of death will not be clear until a formal necropsy is completed.